The first pitches have been thrown out, strikes have been called, and just like that—it’s baseball season. If you have a kiddo playing Little League, or one who is on the high school team this spring, now is a great time for a quick refresher on common baseball injuries and how to prevent them. The most frequent injuries we see in our offices are overuse injuries affecting the shoulder and elbow. Throwing the ball too fast, too hard, and too often can irritate and injure the muscles and tendons surrounding these joints, as well as the bones themselves. Other baseball injuries in Austin that we may treat include sprains and strains, or broken bones and fractures. Warm up before each practice and game with stretches, running, and easy, slow throwing. Rotate playing at other positions besides just pitcher. 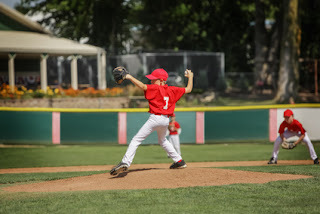 If pitching, stick to Little League Baseball’s pitch count guidelines established to minimize fatigue and overuse in a child’s pitching arm. Stop pitching, or swinging the bat, if complaining of shoulder or elbow pain. Don't pitch on consecutive days. Prohibit playing baseball, or any one sport, year-round. If your child is suffering from pain experienced on the ball field, contact us for an appointment. Typically rest, heat/ice therapy, and over-the-counter pain medication are sufficient, but sometimes more serious treatment is necessary.